Santiago Ramón y Cajal received a Nobel Prize. In fact, until today, when the 80th anniversary of his death is being commemorated, it remains the only science prize from the Swedish Academy that is one hundred percent Spanish. This is not so much for the fact that the other Spaniard with a Nobel Prize, Severo Ochoa, worked in the United States and shared his nationality with that of his adopted country when his award was granted, but rather because the Asturian biochemist would never have had the necessary means or support in this country to carry out his work, which is essential for strong and sustained scientific progress. However, as a rare exception, this was not an impediment for Ramón y Cajal. In fact, so isolated and lonely was his labour that he needed foreign support for his work to be disseminated and taken seriously, and so rare was his case that the anthropologist and intellectual Falangist Pedro Lain Entralgo placed him at the head of what he coined the Generation of Sages, a label that would be absurd in other countries with a greater scientific tradition. 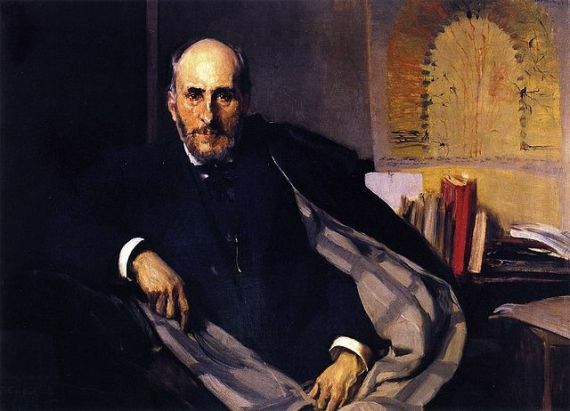 Portrait of Santiago Ramon y Cajal (1852 – 1934), by Joaquin Sorolla, in 1906 (the year when he received the Nobel prize). The achievements of Ramón y Cajal were possible under such conditions because to achieve them it was enough to have a handful of rudimentary tools: brain tissue preparations, some chemical products, microscopes, cameras, drawing tools and unparalleled insight. Using only these elements, he was able to develop the doctrine of the neuron, according to which the nerve tissue is comprised of interconnected discrete units, responsible for brain activity and along which the impulse is transmitted in only one direction. Ironically, Ramón y Cajal had to share the prize with the Italian Camillo Golgi, inventor of the method of staining that the Spaniard had used; Golgi would defend, even in his speech accepting the prize, the erroneous theory that neurons were not separate cells, but rather formed a continuous network. The Swedish Academy honored the two researchers in 1906 “in recognition of their work on the structure of the nervous system.” But the shared prize is an affront to Ramón y Cajal since Golgi only provided a methodological advance, while the Aragonese had to found a new branch of science in order to be recognized. One could almost say that every sentence of Ramón y Cajal’s Nobel acceptance speech served as a starting point for a whole line of research that has kept the scientists of several laboratories busy for a century. But if his individual findings are placed in the context of current knowledge, some of them have demonstrated such a transcendental significance that on their own they would merit a second posthumous Nobel Prize, if that were possible. Part of Ramón y Cajal’s talent consisted in seeing something new where others had already looked. 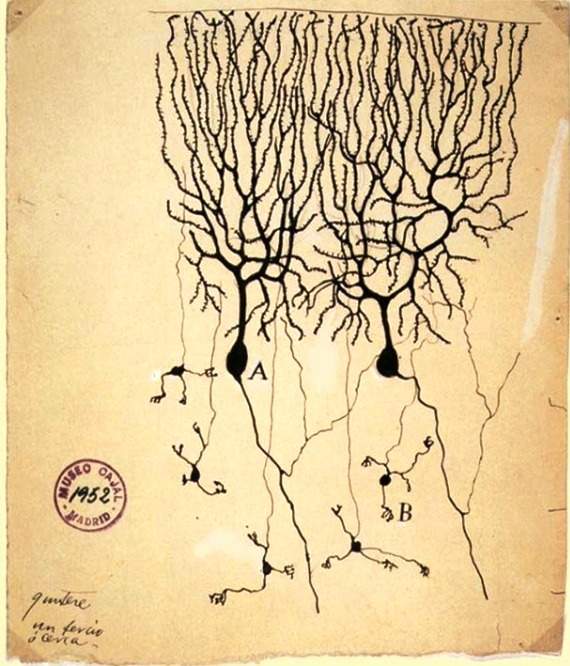 In 1888, while studying microscopically the “butterflies of the soul”, as he called the neurons in his preparations, he “observed that in the forest of extensions of a type of neuron called pyramidal, the branches were not smooth but were covered with tiny spines,” relates neurobiologist Javier de Felipe, research professor of the Ramón y Cajal Institute (CSIC) and head of the Laboratory of Cortical Circuits of the Polytechnic University of Madrid and the CSIC. Ramón y Cajal proposed that these spines functioned as connections between these neuronal extensions, called dendrites, and the axons, the cables that transmit the impulse from the body of the neuron. Therefore, dendritic spines act as receptors in nerve transmissions. “They didn’t believe him,” said De Felipe. “The neurohistologists of his time, especially the Germans, said that his drawings were just artistic interpretations of reality.” However, far from being intimidated, Ramón y Cajal made ​​his famous battle cry, “let us Aragonese show tenacity, lest the Germans drive us off.” The discovery of dendritic spines was almost missed by the tribute of the Swedish Academy to his work. According to De Felipe, “it was necessary to wait half a century for electron microscopy to confirm that dendritic spines were postsynaptic”, in other words, receptors of the impulse just as Ramón y Cajal had predicted. Dendritic spines began to take on greater importance in neuroscience in the 1970s “when it was discovered that their anomalies corresponded with mental retardation,” says De Felipe. Since then it has been shown that these neural spines are not only crucial in the processing of information, but they also act as storage units with different functions according to their morphology: “large spines are stable and represent the physical traces of long-term memory, while the small ones are mobile and unstable and contribute to learning,” explains De Felipe. Research in the field of dendritic spines continues to reveal findings of great impact. Last May, the magazine Science published a study that found that sleep after learning stabilizes newly formed spines in order to consolidate memory, a mechanism that explains why sleep helps to set new knowledge. Just one month ago, a study in The Journal of Neuroscience identified a gene whose defects cause an overabundance of dendritic spines, a phenomenon characteristic of autism. De Felipe’s own research has revealed that inside dendritic spines reside part of what distinguishes us from other species. Comparative studies indicate that the spines are more abundant in the human brain. “The pyramidal cells of the human prefrontal cortex have 72% more spines than the macaque, and about four times more than the prefrontal cortex of the capuchin or the motor cortex of the mouse,” explains the neurobiologist. Our spines are also longer and thicker. “The heads of the spines in human beings have 100% more volume than in the somatosensory cortex of the mouse, and the neck length of the spines is significantly higher (about 30%) in humans than in mice,” adds De Felipe. All this suggests that dendritic spines form a distinct and unique identity of each brain. To illustrate this, De Felipe has conceived of the curious initiative of transforming this personal cerebral fingerprint into music. The team led by the neurobiologist has recently published an article in the journal Neuroinformatics about creating a software tool that assigns a score to each spine according to its morphological features. “The idea is to play the resulting score and hear how each brain sounds.” Entitled The song of the neurons, the Almus String Quartet will perform two pieces that represent the music of a healthy brain and one with Alzheimer’s, a disease that destroys the dendritic spines. In this way, De Felipe intends to capture how new technologies can contribute to the study of neurodegenerative diseases. “Is music the key to unlocking some of the secrets guarded by the neuronal forests?” the researcher wonders.